Last week I got a message from my nephew asking to call his mother. My cousin wanted to talk about her son’s higher education. She was confused. With the plethora of institutions and courses available, the family was unable to choose a good college and majors for him. I understood their dilemma. I was at the same crossroads with my younger brother. We had a tough time narrowing down his college. Thankfully, with the advent of technology, now we can make informed decisions. When my cousin asked me to check colleges in Punjab and nearby states, I googled. I wanted to check the top colleges, popular courses and their admission process. Luckily, I landed to www.collegedunia.com - one of a kind portal that answers all education related queries. The information available on the website is self-explanatory. One can surf from one link to another to get all the necessary information. 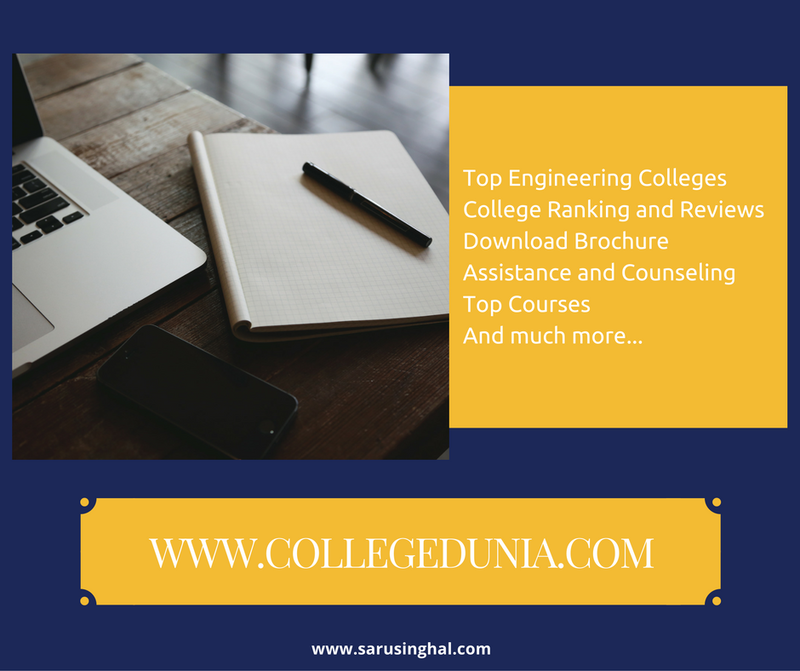 First, I searched the Top Engineering Colleges in India. The list is exhaustive and includes reviews, courses available, fees structure, scholarship, hostel information and the like. To make things easier for parents and prospective students, one can download the brochure of college in one click. It sounded convenient. While I was glancing and the information was too much to process that time. I simply added few of the colleges to my list by pressing ‘Add to Favorite’ button. I wanted a list which I could present to my cousin later. This feature helped a lot in that regard. The website prompts and asks for details at this stage, though. In case you want to apply for a loan and seek counseling assistance, I recommend you go with for it. After checking the prominent colleges, I checked what she asked for. Checking the best colleges of any region is a cake walk on the website. I did it two clicks. One - click colleges on top. Two - select preferred states. Once I had the list, I read the ranking and reviews of the top 10 colleges. By this time, I had enough information to guide my cousin. But instead of sharing my list with her, I felt it was better to ask her to navigate the portal herself. And she did so along with her husband and son. Last time I talked to her, she had clarity. She found the website useful, informative and easy. In case you have a family member or friend who needs guidance with regard to education or career prospects, I recommend browsing www.collegedunia.com, it will give you insightful details which are otherwise hard to get. It answers every kind of education related queries - college ranking, cut off, reviews, assistance, admission process. For example, I wanted to check IIT Patna cutoff for this year, and it was available on the website. For those who are unable to decide a career path.The website’s ‘Choose Your Future’ tab is efficacious. It gives systematic information and helps to narrow down your options. I am recommending it to my friend whose son is appearing for matriculation exam this year. The website doesn’t limit itself to education degrees only. There is a section devoted to Government Jobs. It provides information about Banking, UPSC, SSC and PSU recruitments. One feature which I felt could have been useful to me 10 years back is ‘Study Abroad.’ This section gives clarity to all those who wish to go abroad and pursue higher degrees. In addition to the database of colleges, the website also offers personal assistance. Fill the form and it provides necessary material to your questions. Also, one can get college and exam notifications on your email or mobile devices. Next time you have any education related query, don’t Google it, browse collegedunia.com instead. I guess a very helpful site ..
Technology being helpful to us . Sounds like a very helpful site for students.It's best to research beforehand. Found your blog from Aseem's post in #Thankful Thursdays .